Straight up: Your awesome script might be the next Oscar sweeper, but if it smells like the work of an amateur, you’re hosed, because it’s likely not getting past the first few people who read it. My company Screenplay Readers is a script coverage service that reads hundreds of scripts per month, and we’ve been doing it for two decades. We see an amazing array of “cosmetic” mistakes on a daily basis. From punctuation to usage to spelling. And beyond. But here are a few weird but quite common script formatting mistakes / cosmetic glitches we see, day in and day out. A lot of this stuff we fix as part of our script formatting and proofreading service, but you shouldn’t have to hire us to fix this mess if you don’t make a mess to begin with. ALICE and VERA go down to the RAILROAD STATION. ALICE puts down her SUITCASE. ALICE turns to the CONDUCTOR who is taking TICKETS. She looks and sees WICKED WIZARD! Introduce characters in CAPS. Then only use caps for IMMENSELY BIG THINGS that the reader MUST understand. If you caps everything, nothing stands out. Thinking of using bold anywhere in your script? Don’t! A well placed “BANG” here and there isn’t going to keep you from an Oscar, but don’t use a ton of BOOMS and BANGS and other sound effects unless you’re writing the next Roger Rabbit installment. You’re an agent who has 3 scripts to read this weekend. Which below would you rather read? Jane walks into the room, closes the door behind her, and pours herself some coffee. She is wearing a beautiful sequined gown and a tiara and her ribbon from the pageant. She looks drunk and weary. The telephone rings but she is unsure about picking it up. She does anyway, and it turns out, it’s Mr. McCoy, her boss. Jane, drunk and still in her pageant getup, slumps in and pours some coffee. Brief is awesome. So brief that your script sounds like a haiku: not awesome. Communicate to your reader briefly, but not in morse code. Really? You mean after this page I’m reading, the script continues on the following pages? STOP THE PRESSES. Because that’s super important information; information that any reader would never be able to glean on their own. Right? Sarcasm aside – if your script is your living room, these suckers are just bad feng shui. I’m throwing this out there because there are camps in the screenwriting / film community that believe including your WGA registration number on the title page is the mark of an amateur. We have a 120 page limit at Screenplay Readers before we charge an extra amount for script coverage. So it never fails that one or two clients per month try to sneak under that 120 page limit by “cheating” their dialogue blocks or margins to be wider. You may fool some new readers, or preliminary screeners at script contests, but certainly not agents or producers or the higher-tier judges. A better idea: do a card trick. We might like you more. One letter. One huge difference. 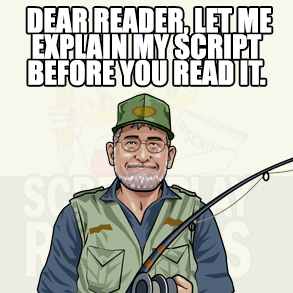 If your script requires a personal handwritten note from you in order to get it, I recommend you put down screenwriting and go buy a bait shop or something. Leaving notes for the reader is the height of amateurosity. Cast of characters, music cues, synopsis, logline – all that stuff shouldn’t be anywhere near your script. Let your screenplay speak for itself. Bottom line (and this is actually the real-life bottom line here in this article): Your script may be the smartest, most talented kid on the block, but don’t send it to school wearing crappy clothes. Is bolding slug lines permissible or a deal breaker? Not a dealbreaker. Lots of scripts have it. Lots of writers do it. Me, I opt to not, because I find it easier to emphasize words I want to emphasize without bolded scene headers. This is an entirely refreshing read. Few are the times that i laugh aloud to a tips-type page. Well done! Screenplay Readers helps filmmakers make sure their script is as tight as it can be, before sending it out to producers. Let us read yours and suggest a few fixes! We won't bite. © 1999-2019 Screenplay Readers. All rights reserved.